(Garryowen) In celebration of the Lewis and Clark Bicentennial, The Custer Battlefield Museum, in Garryowen, Montana is showcasing an exceptional collection of Lewis and Clark rare books, oil paintings, documents, and historical ephemera. This one-of-a-kind display has been touted by historians as a must see. The collection includes extremely rare documents and books detailing the five year expedition of Lewis and Clark and the Corps of Discovery. In addition, the show features numerous plein air oil paintings by noted western artist Tom Waugh, depicting the journey of Lewis and Clark through the Yellowstone Valley. Also on exhibit are three figurines depicting Lewis, Clark and Sacagawea, which were created from period clothing by David Powell, a well known Montana artist who was recently inducted into the elite organization of Cowboy Artists of America. "The Lewis and Clark Expedition was the first government survey of natural resources in the American West, and its importance cannot be overstated. "said Custer Battlefield Museum Director Chris Kortlander. Highlights of the exhibit include the hand notated and signed set of journal notes of the firs officially authorized publication of the travels of Meriwether Lewis and William Clark, owned by Nicholas Biddle, editor of Lewis and Clark's journals. His personal set contains original handwritten notes and several period newspaper articles, as well as the very first images of Lewis and Clark ever produced. These images were created by the Department of the Treasury master steel plate engraver Toppan, who gave the proof images to Biddle himself. These images were tipped in by Biddle to his 1st edition set of journals which are now on display. Another highlight of the exhibit is an original document signed by William Clark appointing Justice of the Peace for the county of Copper in the state of Missouri. The exhibit also includes Sergeant Patrick Gass' personal journal filled with hand-drawn scenes and first-hand accounts of the Corps' daily struggles. Along with an engraved peace pipe that is believed to have been acquired through the Corps' interaction with native Indians, as well as an 1809 counterfeit journal and original 1st editions of the 1814 Corps journals. "We are so excited to have assembled this exceptional collection of Lewis and Clark journals and ephemera, "Kortlander stated. "This is one of the finest Lewis and Clark exhibits in the American West and we are honored to bring it to an interested public." The museum display can be viewed at the Custer Battlefield Museum at Garryowen, Montana. Monday-Saturday from 8:00 a.m. to 8:00 p.m. July 15 through September 29th and special exhibit tours can be arranged. 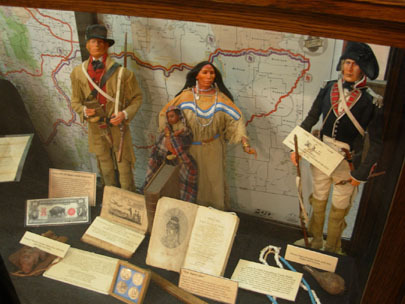 More information about the Lewis and Clark exhibit as well as other museum displays and historical travel opportunities in the area can be obtained by contacting the Custer Battlefield Musueum at (406) 638-1876, or visiting the museum's website:www.custermuseum.org.